Valentine's Day is one of those holiday/non-holidays that I can take or leave. When I was single, I spent many a Valentine's Day dressed in black with my other single girlfriends, treating ourselves out to a nice dinner and then having a fantastic time letting guys buy us drinks and dancing the night away. When my husband and I began dating I made him cookies for our first Valentine's Day. He loved that. He's a sucker for homemade gifts. The cookie theme stuck throughout our courtship (including me express posting packages of them to him when he was in college across country). Incidentally, we had cookies for guest treats at our wedding instead of the traditional party mints to keep with the theme. We've had a variety or Valentine's dates over the years. One of the most memorable we spent at a cooking class that was advertised as a romantic night of cooking for two. There were other couples there ready to learn and feast with this great chef. The funny part (and unromantic part) was the lone single woman who kept inturrupting the chef and the company host who insisted that the chef portion out small to us. She was also a rather brash personality that just did not add to the ambiance of it. We ended up picking ourselves up a burger afterwards so we wouldn't go hungry. Ahh well, we tried. This year we are on a rather strict budget so no going out date. We have become experts at the at home date, once the kids are in bed. Kids see Valentines Day as something special too. What kid doesn't get excited about all the cards being exchanged with friends. Never mind all the heart cut-outs and small school celebration attached to it. Anything to break the routine of day to day school. I like to do a little something for my kids on Valentines day - nothing too big (it's not a second Christmas) but a little treat because I love them. I went to a card-making craft session on Friday and make everyone some cute Valentines. And I've stocked up on Hershey's kisses and cinnamon hearts to have on the table on Monday. 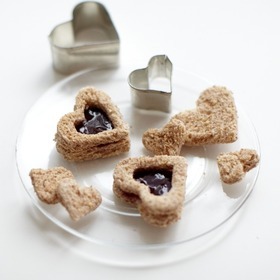 Do you want to see the cute jam heart breakfast sandwiches I'll be making? I got this idea on Chatelaine's website here. Cute eh? What I didn't realize until today is that I do not have heart shaped cookie cutters of my own. That's just not right! I did pick some up at the dollar store this afternoon. 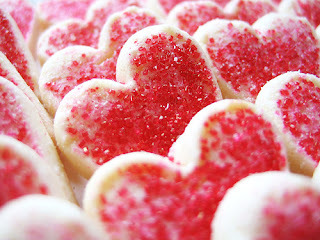 I'm planning on making some sugar cookies with my boys tomorrow. Always a great treat. Here's my favorite sugar cookie recipe. It is from Mrs. Field's Best Cookie Book Ever. Pre-heat oven to 325*. In a medium bowl, combine flour and salt with a whisk, set aside. In a large bowl, cream the butter and sugar with an electric mixer on medium speed. Add the egg and vanilla, beat until well mixed. Add the flour mixture, Blend on a low speed just until combined, don't overmix. Gather the dough into a ball, flatten the ball into a disk and wrap tightly in plastic wrap. Refrigerate one hour until firm. On a floured surface, roll out the dough to about 1/4 inch thick. Use cookie cutters to cut the dough into fun shapes. Bake for 13-15 minutes. 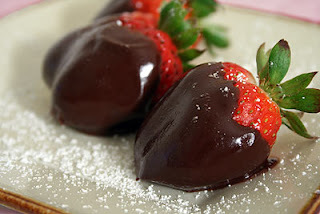 And for our Valentine's dinner - here's the planned menu (shh, don't tell my husband, it's a surprise for him!) - Basically, it's his favorite meal. Avacado salad, Shrimp in garlic butter, steak, baby potatoes followed with strawberries dipped in chocolate. Sounds good, doesn't it? What kind of plans do you have for your Valentine's Day this year? Yummm...your meal sounds deee-licious, made with love! Yes it does sound good. The strawberries and cookies are a special treat too!